Google+ is growing: ignore it at your peril. There are currently about 250 million users and this will only increase. It’s not a case of Google+ being integrated into Google as a product but Google are transforming all their products into features of Google+. This means that the services run by competitors may eventually become redundant. Why go to the effort of downloading Skype when you’ve already got access to Google Hangouts on a service that you’re already signed up to? Even if Google+ doesn’t seem to have caught on particularly at the moment as a social network when you compare it to Facebook or Twitter, it’s important to get in now and build your presence. After all, Google+ is Google. Their search algorithm is drawing in results directly from Google+. This means that you need Google+ presence for search visibility. It may be a slow burn but it looks like Google+ may become the dominating social network. Before you moan about the time you haven’t got to dedicate to another social site it’s good to know that you don’t have to spend hours on Google+ to make the most of it. Below are 5 steps that will give your Google+ presence a kickstart. Your first priority for optimising your profile is your photo and the About section. The photo on your personal profile should be a clear and easily recognisable headshot. The reason for this will be made clear later. The About section of your profile is your chance to tell the world about yourself and your brand using specific and descriptive copy. The page should include relevant keywords and links so that it is easier for searchers to find your Google+ profile. It’s possible to include links in your text to take users directly to important pages on your website, even your contact page, which is particularly nifty. Google’s search algorithm is pulling search results directly from Google+ so it’s important to include relevant keywords within your posts so that they will show up in the search results of people in your circles. To get the best results from Google+ you should post frequently, while remembering that this is not Twitter. Think quality over quantity. Google+ allows for long, content rich posts. Whereas with Twitter you may only have enough characters to share a link, with Google+ you have the space and freedom to comment on why that link interests you: how is it relevant to your brand? What do you think about it? When posting a link a thumbnail image is generated so your post already looks more attractive to the user. The more relevant and content-based your Google+ posts are the more likely you are to show up in search results. The more people who see your posts the more likely it is that your post will be shared and you can increase your followers and your possible reach. Google+ Events is pretty cool. You can use Google+ Events to create a buzz around events that you are already hosting. Not only can you send customised invitations to anyone regardless of whether they are on Google+ but it syncs with Google Calendar, automatically showing when someone confirms their attendance. Google+ Events can be used for all types of events, including webinars, conferences, parties and, of course, Google+ Hangouts. The most exciting and innovative feature is “Party Mode”, which allows everyone at the event to instantly upload photos from their smart phones and document the event in real-time. We tried this out before Christmas for our secret santa present opening and it was pretty easy to use and great fun. It’s so much quicker than uploading all your photos in bulk after the event. Could this be the new Tweetup? Google is using SEO benefits as a carrot to coax bloggers and webmasters into using and engaging with Google+. Google will authenticate your content using Google Authorship. This tool will also allow Google to increasingly trust you as a quality source of content. I won’t go on about the details here as we’ve already published a blog post about Author Tags. But to give a very brief overview, Google Authorship links your Google+ profile with your content and vice versa. Once your author tag is set up, your Google+ profile picture will start to appear next to your content in search engine result pages. This image makes your content look more trustworthy and will increase clicks. This is why you need to have a clear headshot for your profile photo. The point of social networks is to be sociable. This means sharing content, commenting on others’ posts and generally taking part in relevant conversations that you care about. However, there’s not much point doing this if you’re not adding value. Don’t gatecrash a conversation by simply commenting “Great post!”. What’s the value in that? No-one is going to click through to your profile based on that. Google+, unsurprisingly, offers an excellent search function. You can search by keyword to find relevant users. You can also use the search function to search for mentions of your brand or industry-related keywords and save your searches for quick reference later. This allows you to monitor your saved searches and respond to mentions, comment on threads and re-share people’s posts, which shows potential contacts and customers that your business is switched on. The aim of the game is to increase your circles and the number of people in those circles. The more people in your circles, the more who will be exposed to your content and social actions. Get to know your audience on Google+ by asking questions, polling, sharing content and interacting. Once you know your audience you can tailor your content accordingly. 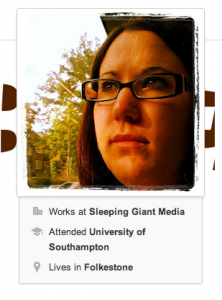 Hopefully these quick wins will have given you a few pointers to give your Google+ profile a boost. Spending just a few minutes each day on Google+ will improve your Google+ profile and your brand’s overall online presence. If you want any advice on how to optimise your Google+ profile please do get in touch with us. For more information on using Google+ to market your business take a look at our Google+ marketing page.